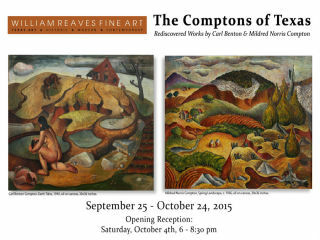 William Reaves Fine Art announces The Comptons of Texas: Rediscovered Works of Carl Benton and Mildred Norris Compton. In this exhibition, the Reaves group brings this long-forgotten duo of Texas artists and a collection of their best works back to gallery walls for the first time in 60 years. The exhibition features over 50 oils, watercolors, temperas, ceramic and wood sculptures from the couple’s time in Texas, spanning 1936 to 1955. The Comptons of Texas is an exhibit of consequence, and it will hold special appeal to those who appreciate the rise of the arts in both Texas and Latin America during this signal period.